Donny Osborne, originally from Chicago, grew up at the Slingerland Drum factory, with piles of drums around him his whole life. 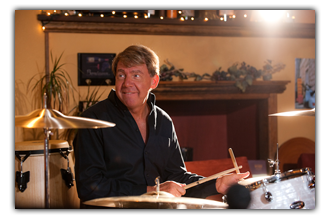 As Buddy Rich’s protégé, Donny went on to play for royalty and presidents around the world with Mel Torme for 25 years. A short list of Donny’s credits includes stints with Gene Krupa, Steve Allen, Terry Gibbs, Woody Herman, Jerry Lewis, Rich Little, Shechy Green, Flip Wilson, Ella Fitzgerald, Sarah Vaughn, and Gerry Mulligan.